I’ve worked on a number of roadway, tunnel, and transit projects, in particular with SFMTA (Muni) to renovate the lighting in their existing subway and light rail systems, and design the lighting for the forthcoming Central Subway and 4th Street Line. Lighting for these type of facilities is ‘functional’ or ‘utilitarian,’ so I think a lot of people assume that there isn’t so much for a designer to do. But reducing energy and maintenance costs while improving the quality of lighting (and with often challenging mounting locations) has proven to be some of the most rewarding design work that I’ve done. 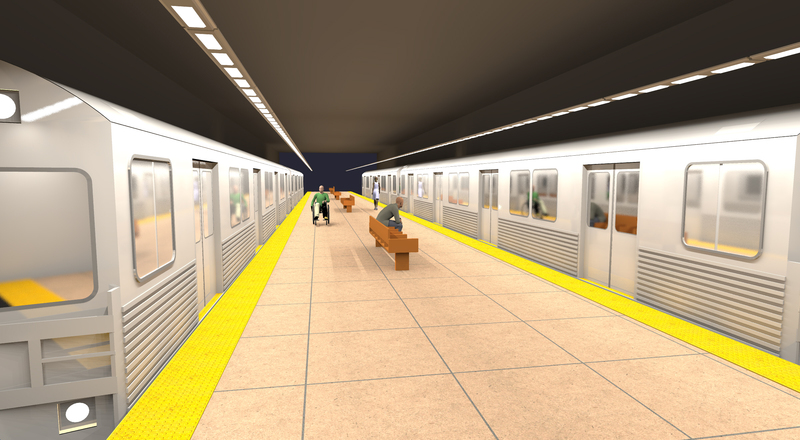 Image: raytrace rendering of planned lighting for a subway platform.